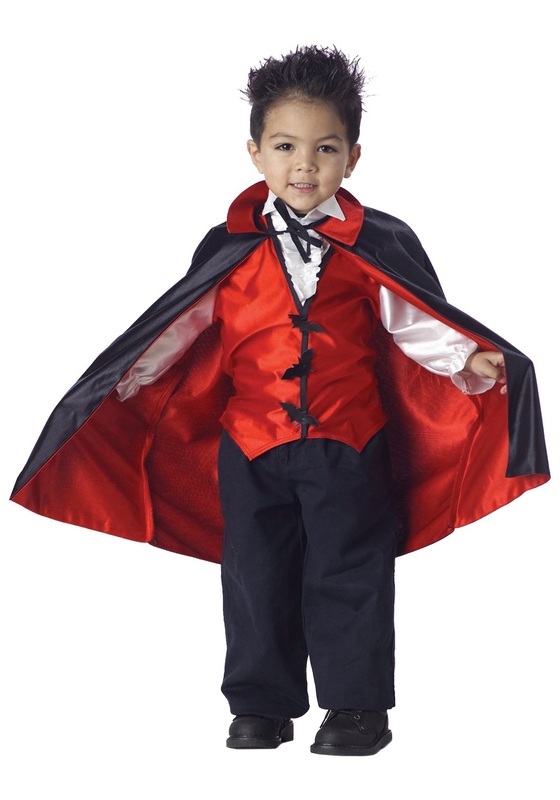 This Toddler Vampire Costume is too adorable to be scary! But be careful: the cute ones are always the ones to watch out for. It's made of a shimmery, gothic-style polyester fabric styled to look like a red vest over a white shirt. A clever stylistic touch, three faux-leather bats are sewn to the center-front of the shirt, and a collared cape has a black outer shell and red lining. All that said, we think the creepy creatures in Transylvania should take notes from, say, your son when he rocks this cool costume. Count Dracula and other castle- and shadow-dwellers would all be a little less scary if they were all small, adorable, and dressed to the nines like this, but they could learn a thing or two by your little's one's obviously keen sartorial sense. Just remember: the cute ones are always, always the ones to watch out for! This costume was adorable. My grandson really wanted to be a vampire and when I saw this costume I knew it would be perfect and it was. He loved it.